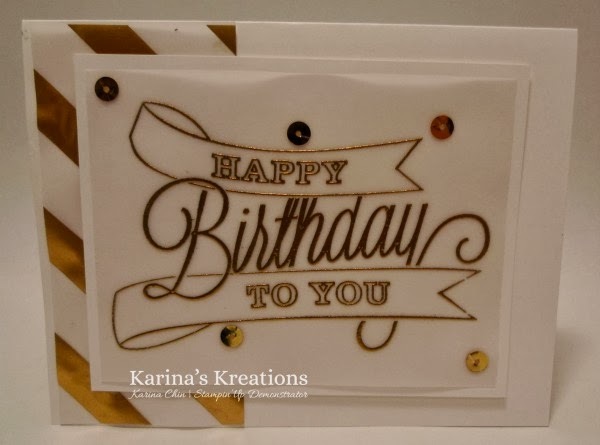 Karina's Kreations: Stampin'Up Another Great Year Card! Stampin'Up Another Great Year Card! What are you doing on Jan 26th? Are you coming to my 20 card Birthday Bash Extravaganza? You'll make 20 different birthday cards in one afternoon. This is one of the cards which uses the new Another Great Year stamp set. The greeting was embossed with Gold Embossing Powder on Vellum card stock. I added some Gold Fancy Foil Designer Vellum and Gold Sequins to the card. Register by Jan 17 at kchin2@telus.net. Here's the deals of the week.